trio of young acts that espouse different, bold sounds dominates the list of finalists for the second annual Billboard Mexican Music Awards, which will be broadcast live from Los Angeles' Shrine Auditorium on Telemundo Oct. 18. Presented by State Farm, the Billboard Mexican Music Awards are the only nationally televised awards that exclusively honor regional Mexican music. Finalists and winners of the 33 awards are determined by chart performance as chronicled in Billboard Magazine and on billboard.com during the eligibility period of August 27, 2011 through August 18, 2012. Award categories are based on album and digital track sales data provided by Nielsen SoundScan and radio airplay monitored by Nielsen BDS. Leading the pack, with nods in 12 categories, is 3BallMTY, the young Mexican DJ collective whose mix of cumbia and electronica is at the forefront of the new tribal music movement. They are followed by hard-hitting corrido singer/songwriter Gerardo Ortiz, a finalist in 11 categories, and eclectic singer/songwriter Espinoza Paz, with 11 nods in 10 categories (he competes against himself in the Banda Album of the Year category). All three acts have, in their own way, broken ground both with their music and their style and branding, reaching not only traditional followers of the genre, but also younger, home-grown fans who have found artists they can relate to. 3BallMTY, who had their national television debut at last year's Mexican Music Awards, broke ground with their infectious single "Inténtalo," a finalist in the Song of the Year, Song of the Year-Vocal Event and Duranguense/Grupero/Cumbia Song of the Year categories. 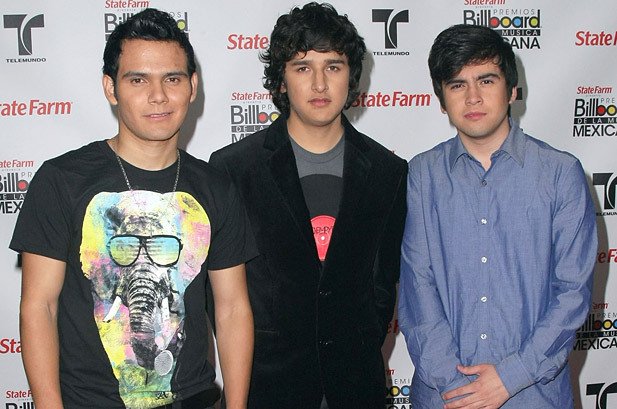 Sales of the subsequent album of the same name, out on Fonovisa, helped make the group a finalist for Artist of the Year, Artist of the Year-New, Artist of the Year-Duo or Group, Albums Artist of the Year, Songs Artist of the Year, Digital Download Artist of the Year, and Duranguense/Grupero/Cumbia Artist of the Year. Paz, another Fonovisa artist, is a finalist in the Artist of the Year, Artist of the Year-Male, Songs Artist of the Year, Digital Download Artist of the Year, Albums Artist of the Year and Banda Artist of the Year categories thanks to two albums, Canciones que Duelen and Un Hombre Normal, both finalists for Banda Album of the Year. Paz's song "Para No Perderte" is a finalist for Norteño Song of the year while Paz himself is a finalist in the Songwriter and Producer of the Year categories. On his end, Del Records/Sony Music Latin act Ortiz, the top winner at the inaugural Billboard Mexican Music Awards in 2011, is a finalist for Artist of the Year, Artist of the Year-Male, Songs Artist of the Year, Digital Download Artist of the Year, Albums Artist of the Year, Norteño Artist of the Year, and Songwriter of the Year. His album Entre Dios y el Diablo competes for Album of the Year and Norteño Album of the Year; while his song "Amor Confuso" vies for Song of the Year and Norteño Song of the Year. Among the more veteran acts, the leading finalists were perennial hitmakers La Arrolladora Banda el Limón de René Camacho, competing for nine awards, including Artist of the Year and Songs Artist of the Year. La Arrolladora's hit "Llamada de mi Ex" is also a finalist for Song of the Year and Banda Song of the Year. La Arrolladora's director, Fernando Camacho Tirado is also a finalist in the Producer of the year category, an award he won in 2011. The group was followed in sheer number of finalist nods by two other up-and-coming acts-Julión Alvarez y Su Norteño Banda with six nods-including Artist of the year-Duo or Troup and Airplay Artist of the Year-- and América Sierra, the featured vocalist in 3BallMTY's hit "Inténtalo" with five. Alvarez is also a finalist for Producer of the Year. Finalists up for four awards include Jenni Rivera, Shaila Durcal, Vicente Fernandez and Joan Sebastian. Those up for three awards include Banda el Recodo de Cruz Lizarraga, El Bebeto and Tierra Cali.